Leon Trotsky’s History of the Russian Revolution remains a singular work of Marxist historiography. As this series of articles commemorating the Russian Revolution draws to its close, we should consider the single most compelling account of that moment. Written by one of its leading participants, Leon Trotsky’s The History of the Russian Revolution was completed in 1930, with Trotsky recently exiled from Russia and living in Turkey. Despite its length — the 1977 edition from which I quote runs to nearly 1,300 pages — the work is tightly focused on the months between February and October 1917. With the exception of six initial chapters that explain the book’s theoretical framework and historical context and six appendices challenging Stalinist claims, each volume deals with only a matter of months. Volume one runs from February to June, volume two from July to September, and volume three spans October itself, concluding in the immediate aftermath of the Bolsheviks’ seizure of power. You can present a photograph of a hand on one page, but it requires a volume to present the results of a microscopic investigation of its tissues. The author has no illusion as to the fullness or finishedness of his investigation. But nevertheless in many cases he was obliged to employ methods closer to the microscope than the camera. History takes a narrative form, but Trotsky uses his “microscope” to conduct close analysis, occasionally pausing the story to address problems that have since emerged. Typically, he devotes entire chapters to these issues, which include questions of agency (“Who Led the February Insurrection?”), possible alternative outcomes (“Could the Bolsheviks have Seized the Power in July?”), new situations (“Dual Power”), outstanding issues (“The Problem of Nationalities”), and the very act of taking state power (“The Art of Insurrection”). These do not interrupt or divert from the flow of history, but rather enrich our understanding of the events before returning to the narrative. A distinct theoretical framework supports these analyses. Indeed, few works of Marxist historiography have as resolutely a theoretical edge as the History. Fewer still begin by introducing a new theoretical concept, as Trotsky does in the first chapter. If Trotsky’s main strategic contribution to Marxism is his distinct version of “permanent revolution,” then his major theoretical contribution is “uneven and combined development.” Through developing the latter, he simply wanted to explain the conditions under which permanent revolution could take place, first in Russia, then other countries in which similar conditions prevailed, starting with China. Twenty-five years earlier Trotsky had argued that, though capitalist relations of production had been established in Russia and were perhaps even becoming dominant, the bourgeois revolution — in the sense of the establishment of a capitalist state — had yet to take place. The existence of a militant working class made the bourgeoisie unwilling to launch a revolution on their own behalf, for fear that they would quickly lose control. But the working class could accomplish the revolution against the pre-capitalist state and, at least in Trotsky’s version of permanent revolution, move directly to constructing socialism, as long as the events unfolded as part of a successful international revolutionary movement. Historical backwardness does not imply a simple reproduction of the development of advanced countries, England or France, with a delay of one, two, or three centuries. It engenders an entirely new “combined” social formation in which the latest conquests of capitalist technique and structure root themselves into relations of feudal or pre-feudal barbarism, transforming and subjecting them and creating peculiar relations of classes. These adoptions did not necessarily undermine the state, since “The [backward] nation … not infrequently debases the achievements borrowed from outside in the process of adapting them to its own more primitive culture.” Indeed, at least initially, “debased adaptation” helped preserve Russia’s pre-capitalist state. Beginning in 1861, tsarism needed to produce arms in order to defend feudal absolutism, so it established factories using the techniques characteristic of monopoly capitalism. But the workers needed to fuel this production threatened the state. The industrial laborers constituted a more skilled and more politically conscious group than any previous absolutist or early capitalist state had faced. Uneven and combined development created a Russian working class that possessed exceptional levels of revolutionary militancy, even if it was only a minority of the population. The undemocratic state, which this “debased adaptation” of capitalism was supposed to preserve, provoked the working class into destroying it. Thus, for Trotsky, uneven and combined development potentially enhanced workers’ political and industrial organization, their theoretical understanding, and their revolutionary activity. This did not guarantee victory — that required a revolutionary party with strategic intelligence and a global context in which revolutions in more advanced countries could offer aid to the materially backward Russia — but it was the necessary starting point for both the revolution and Trotsky’s account of it. Any appreciation of the History that follows the tour-de-force opening chapter has to begin with how original, indeed how unprecedented, it is within the Marxist tradition, precisely because it’s a work of history. It’s odd, given that the most common synonym for Marxism is historical materialism, just how few works of Marxist historiography had actually been written before 1930. Marx and Engels’s early 1850s writings — “The Class Struggles in France,” “Revolution and Counter-Revolution in Germany,” “The Eighteenth Brumaire of Louis Bonaparte,” and Marx’s later defense of the Paris Commune (“The Civil War in France”) — are often cited as launching the tradition to which Trotsky then contributed. But these are not historiographies; they are brilliant journalistic assessments written in the immediate aftermath of events. Of Trotsky’s works, 1905 (1907) perhaps most closely resembles them, standing as it does in comparable chronological closeness to its subject and written as it was in similar conditions of defeat and exile. Of course, Marxism’s founders were formulating a theory of historical development and always drew on historical examples to illustrate and substantiate their arguments, but, of all their works, only Engels’s The Peasant War in Germany (1850) can seriously be considered a work of history — and it deals with an episode in the relatively distant past which is explicitly treated as a cautionary tale about the dangers of attempting to take power before conditions were ripe. The situation didn’t change dramatically with the advent of the Second International in 1889. Part of the problem was that, in the absence of anything resembling a proletarian revolution between the 1871 Paris Commune and the 1905 Russian Revolution, bourgeois revolutions became the main historical subjects for Marxists. Such studies tended to either establish lineages for contemporary socialist thought in, for example, the English Revolution, or to discover examples of communism in the earlier millenarian movements. Histories of the French Revolution, the most important of the bourgeois revolutions with regard to mass participation, had existed for over a hundred years — the initial works by Francois Mignet and Adolphe Theirs appeared in the 1820s — but it took until the dawn of the twentieth century for the first socialist, if not exactly Marxist, account to arrive in Jean Jaurès’s Socialist History of the French Revolution. In short, Trotsky had few Marxist models on which to draw. At least formally, then, the History looks most like work by his nineteenth-century bourgeois predecessors. In particular, Thomas Babington Macaulay’s History of England from the Accession of James VII to the Revolution (1848–1853) bears a startling structural resemblance to it. Both begin with a sweeping summary of national development to the eve of revolution before narrowing their focus to an almost day-by-day account; both display the same depth of characterization of historical actors; both authors infuse their works with a distinct theory of history — indeed, Macaulay’s Whiggism is as important an organizing principle as Trotsky’s Marxism. Marx himself did not have a particularly high opinion of Macaulay, calling him “a systematic falsifier of history,” and Trotsky was only marginally more generous (“sometimes interesting but always superficial”). But the parallels between their histories are there all the same. Stylistically, Trotsky recalls another Victorian Scot, though one rather different from Macaulay. In the third volume of his classic biography, Isaac Deutscher follows A. L. Rowse in comparing Trotsky to Thomas Carlyle. Outlandish as this may first appear, Deutscher has identified a real commonality between the two men: both sharply draw out historical irony, both reject the flat register of academic history for language appropriate to the events they describe, and both express collective shifts in consciousness. Compare these passages. What a Paris when the darkness fell! A European metropolitan city hurled suddenly forth from its old combinations and arrangements; to crash tumultuously together, seeking new. Use and wont will no longer direct any man; each man, with what originality he has, must begin thinking; or following those who think. Seven hundred thousand individuals, on the sudden, find all their old paths, old ways of acting and deciding, vanish from under their feet.… On Monday the huge City has awoke, not to its week-day industry: to what a different one! The working man has become a fighting man; has only one want only: that of arms. Trotsky’s style remains readable in a way that Carlyle’s baroque stylings do not. Even so, the two men clearly have the same approach to historical writing, one vastly different from the work of those Carlyle called the “Professors Dryasdust,” who were already coming to dominate the historical profession in his lifetime. More than that: it remains exceptional in the canon of Marxist historiography. Why? Mostly because of the role Trotsky played in the process he describes. Political figures from earlier eras often left memoirs of their involvement in revolutionary events — think of Alexis de Tocqueville’s account of the French Revolution of 1848–49. But one consequence of the defeat of socialist revolutions since 1917 — albeit one less significant than the continuation of exploitation, oppression, and imperialist war — is that there have been very few participant-historians to record them. Trotsky has no successors because his subject remains singular. There were, of course, many memoirs of the events in and around 1917. By the time Trotsky wrote his book, he could access the firsthand accounts from Menshevik opponents like Nikolai Sukhanov, Bolshevik comrades like Alexander Shlyapnikov, and external supporters who had been present in Petrograd like John Reed. The latter was particularly useful for Trotsky’s purposes given that Lenin endorsed it, the communist movement had widely read it, and it highlighted Trotsky’s role at a time when the Stalinist bureaucracy was attempting to deny it. But these works, and the many others that Trotsky cites, mainly concern their authors’ personal experiences or observations: they do not attempt to reconstruct the process as a whole. Trotsky, in contrast, belonged to the Bolshevik Central Committee, served as president of the Petrograd Soviet, and was mainly responsible for ensuring that the latter’s Military Revolutionary Committee actually launched the insurrection. This work will not rely in any degree upon personal recollections. The circumstance that the author was a participant in the events does not free him from the obligation to base his exposition upon historically verified documents. The author speaks of himself, in so far as that is demanded by the course of events, in the third person. And that is not a mere literary form: the subjective tone, inevitable in autobiographies or memoirs, is not permissible in a work of history. However, the fact that the author did participate in the struggle naturally makes easier his understanding, not only of the psychology of the forces in action, both individual and collective, but also of the inner connection of events. But we shouldn’t take Trotsky entirely at his word. He quotes from his own Recollections of Lenin (1924), which are, precisely, “personal recollections,” their status unchanged by being cited as evidence. And, occasionally, the reader has to wonder at the powers of recall that can apparently reproduce contributions to discussions or even speeches without obvious reference to a printed record. History has no formal scholarly apparatus, but Trotsky generally lists his sources in the text: in the rare instances where he does not, one suspects that he is indeed relying on his own memory. Nevertheless, he generally cites printed or unpublished documents. In this context, it’s worth contrasting Trotsky with one of the other authors to whom Deutscher compared him: Winston Churchill, specifically in relation to his history of World War II. The comparison is valid in that Churchill also played an important political role in the events he discusses and was possessed of a distinct — if very different — worldview. But Churchill quite explicitly bases his account on his own perspective and frequently describes events without any supporting evidence, notably the infamous episode in which he and Stalin determine how their respective states will exercise influence in Eastern Europe and the Balkans after the war. The point isn’t that this episode is inaccurately reported — in fact, it reads like exactly the kind of undemocratic carve-up to which these two villains would have agreed while inadvertently revealing Churchill’s illusions about the extent of postwar British power — but it does take a quite different approach than Trotsky, who adheres far more closely to scholarly norms concerning the use of evidence. Critics have pointed out that Trotsky will quote from a source that he elsewhere criticizes for inaccuracy or misapprehension. But Trotsky usually explains why he is or is not relying on a particular author. Reed was an extraordinarily keen observer, able to transcribe upon the pages of his book the feelings and passions of the deciding days of the revolution.… But work done in the heat of events, notes made in corridors, on the streets, beside campfires, conversations and fragmentary phrases caught on the wing, and that too with the need of a translator — all these things made particular mistakes unavoidable. Even if Trotsky can cite his sources and discriminate between them, that doesn’t mean he uses them reliably. The book is the work of a partisan in two respects. The serious and critical reader will not want a treacherous impartiality … but a scientific conscientiousness, which for its sympathies and antipathies — open and undisguised — seeks support in an honest study of the facts, a determination of their real connections, an exposure of the causal laws of their movement. Trotsky draws a distinction between neutrality, an impossibility for anyone not completely devoid of political belief, and objectivity, a necessity for everyone not content to play the role of propagandist. It would be wrong to pretend that Trotsky’s partisanship in this second sense did not produce distortions. His need to set the record straight occasionally led him to exaggerate the differences between Lenin and virtually everyone else in the Bolshevik Party, above all Stalin. Without Lenin the crisis, which the opportunistic leadership was inevitably bound to produce, would have assumed an extraordinarily sharp and protracted character. The conditions of war and revolution, however, would not allow the party a long period for fulfilling its mission. Thus it is by no means excluded that a disorientated and split party might have let slip the revolutionary opportunity for many years. Trotsky is not saying that the Bolsheviks would never have arrived at the correct strategy without Lenin, or that the revolutionary opportunity would have never come again. He simply means that time is of the essence in revolutionary situations and that, without Lenin, the party would have allowed it to pass. Trotsky’s discussion of individual figures aligns with classical Marxist tenets about people making history in conditions not of their own choosing, while also showing that the extent to which they can change history is the outcome of a historical process. In a horizontal section of the historic monarchy, Nicholas is the last link in a dynastic chain. His nearest ancestors, who also in their day were merged in family, caste and bureaucratic collectivity — only a broader one — tried out various measures and methods of government in order to protect the old social regime against the fate advancing upon it. But nevertheless they passed on to Nicholas a chaotic empire already carrying the matured revolution in its womb. If he had any choice left, it was only between different roads to ruin. [T]he external envelope of circumstance — make easy in this case a mechanical contrasting of the person, the hero, the genius, against the objective conditions, the mass, the party. In reality, such a contrast is completely one-sided. Lenin was not an accidental element in the historic development, but a product of the whole past of Russian history. He was embedded in it with deepest roots. Along with the vanguard of the workers, he had lived through their struggle in the course of the preceding quarter century. There is a problem with Trotsky’s argument concerning Lenin, however: at several points, Trotsky argues that the Bolshevik Party was essential for the success of the revolution and that interventionist revolutionary parties are a necessary condition for all future revolutions. However, his own account of the Bolsheviks — or at least their leadership — shows them repeatedly failing to understand the situation, maintaining existing but irrelevant schemas, and being pulled to their right. His divergence from the ruling circles of the Bolsheviks meant the struggle of the future of the party against its past. If Lenin had not been artificially separated from the party by the conditions of emigration and war, the external mechanics of the crisis would not have been so dramatic, and would not have overshadowed to such a degree the inner continuity of the party’s development. This amounts to saying that the party would still have made mistakes, but Lenin could have corrected them more easily. 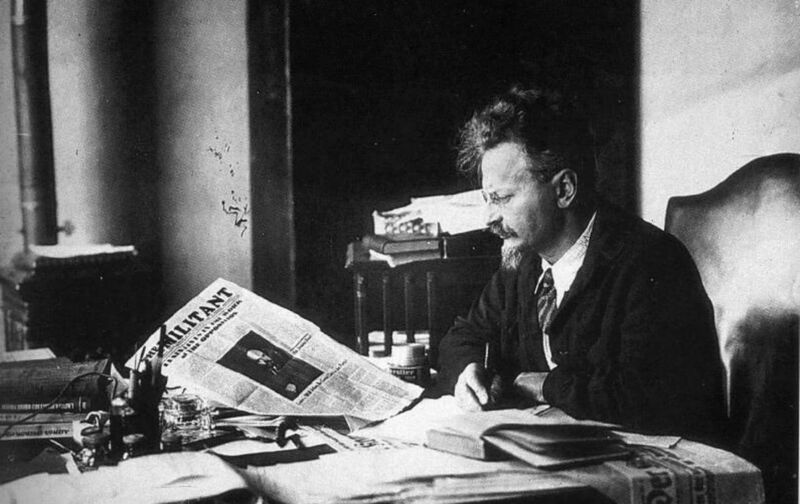 Elsewhere Trotsky credits “the pressure of the workers from below” in addition to “Lenin’s criticism from above” for correcting Bolshevik errors. A party requiring regular correction is clearly not a “vanguard” in any meaningful sense. This represents one of the rare occasions where Trotsky’s desire to weaken specific Stalinist mythologies actually undermines his own arguments about the role of the revolutionary party. Trotsky’s summary of the factors he had to highlight to account for 1917 still forms our research agenda of the Russian Revolution.… Measured against The History of the Russian Revolution most “modern” research does not look so “modern” after all. This is a remarkable judgment for a book written eighty-five years ago: people tend to read Macaulay’s History of England or Carlyle’s The French Revolution for their literary qualities or for what they reveal about their authors’ ideological assumptions, not because they help us understand 1688 or 1789. We can read Trotsky’s History in those ways too, but it also retains an important place in any serious bibliography of 1917. We certainly know more about the Russian Revolution than anyone could in 1930 — not least because of the valuable work of its “revisionist” social historians from the late 1960s onward. But these have supplemented rather than replaced Trotsky’s book. Sharing the revisionists’ concern with history from below, he recognizes the need to balance it with history from above. Equally intent on explaining the structures of Russian society, he situates them within a global system that impacts and shapes their forms. This latter aspect returns us to Trotsky’s — and our — starting point: uneven and combined development. The most indubitable feature of a revolution is the direct interference of the masses in historic events.… The history of a revolution is for us first of all a history of the forcible entrance of the masses into the realm of rulership over their own destiny. As a general characterization of revolutions this will not do: most of the bourgeois revolutions which took place after 1848 were conducted from above precisely in order to forestall “the entrance of the masses.” It is, however, an excellent characterization of socialist revolution, and one that we urgently need to reassert. Our commemorations of 1917 cannot avoid our knowledge of what followed, the full horror of which was still not apparent when Trotsky wrote his History. The Stalinist counterrevolution of 1928 and the regimes that subsequently took that as their model are at least partly responsible for the suspicion toward the idea of socialism from those who have most to gain from it. There are many reasons for encouraging a wide readership of the History, but perhaps the most important is that it describes working-class creativity and power as the real basis of socialism. Hopefully, by the bicentenary, Trotsky’s book will no longer occupy such a lonely place on our bookshelves because 1917 will have been joined by other socialist revolutions that require their own historians. Neil Davidson a lecturer in sociology at the University of Glasgow.